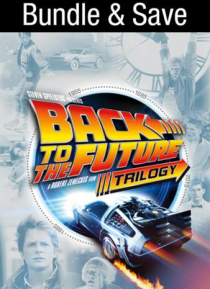 Experience one of the most popular movie series of all time like never before with the Back to the Future Trilogy! Join Marty McFly (Michael J. Fox), Doc Brown (Christopher Lloyd) and a time traveling DeLorean for the adventure of a lifetime as they travel to the past, present and future, setting off a time-shattering chain reaction that disrupts the space time continuum! From filmmakers Steven Sp… ielberg, Robert Zemeckis and Bob Gale, these timeless films feature unrivaled adventures that stands the test of time.